Check this anomymous free proxy list and make simple configuration on web browser, then you can surf the Internet anonymously. By using the anonymous proxy server, it works as intermediate server to send the requests to web servers on Internet on behalf of your computers, so that can hide your computer IP address and prevent unauthorized access to your computer over the Internet. Here is an example of how I configured anonymous proxy server on Mozila Firefox web browser. Just go to Tools -> Options… -> A new window will appear, then click Advanced option and click Network tab -> Click Settings… button -> Click Manual proxy configurations and key in the proxy server IP and port -> Click OK at last. 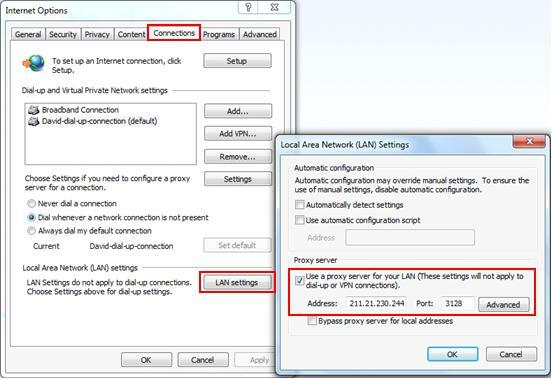 If you use Internet Explorer web browser, here is the way to configure it: Go to Tools -> Internet options -> A new windows will appear, proceed to click Connections tab -> Click LAN settings button -> Another window will appear -> Tick on Use a proxy server for your LAN (These settings will not apply to dial-up or VPN connections) and key in the proxy server IP and port. You can also click Advanced button to do advanced configuration. -> Finally click Apply/OK to close all windows . Also you can check on how to configure other web browsers with proxy server setting here! samair.ru - One of the best sources on the World-Wide Web for proxies. MRP ProxyList - Anonymous web surfing, IRC and email. ProxyBlind.org - Anonymous proxy server list including country from proxyblind.org. freeproxy.ru - Free proxy list: lists of HTTP and SOCKS proxy. NNTime - Welcome to NNTime proxy list pages. DCS - Fresh anonymous proxy list from DCS. proxylists.net - High anonymous HTTP proxy list. DDday.Com - Free web proxy sites and free proxy servers. Proxy Blind - A proxy server is a server that retrieves Web pages for you, providing only its own identity to the sites it visits. PROXY-LIST.NET - Anonymous proxy list. Return to top of "Anonymous Free Proxy List"! !